As violent protests over control of islands claimed by China and Japan flare up, China's Passenger Car Association predicts Japanese brands will lose their lead over German nameplates in the country for the first time since 2005. BEIJING (Bloomberg) -- Two years ago, Sherry Wang bought a Toyota Camry because it offered a comfortable way to commute to her job as a researcher in the Chinese city of Xi'an. Lately, she's been taking the bus. "I'm afraid that my car or I will become a target" of anti-Japanese protesters, who have thronged China's streets in recent days, Wang said. "I just hope life will get back to normal as quickly as possible." Wang illustrates why Japanese carmakers such as Toyota Motor Corp., Nissan Motor Co., and Honda Motor Co. are bracing for what may become a bigger crisis in China than last year's tsunami in Japan. As violent protests over control of islands claimed by both nations flare up, China's Passenger Car Association predicts Japanese brands will lose their lead over German nameplates in the country for the first time since 2005. "The repercussions for Japanese carmakers are very serious and will last for a long time," said Cui Dongshu, deputy secretary general of the Passenger Car Association. "There are plenty of choices. Why bother with Japanese brands if there are concerns of safety due to anti-Japan sentiment?" Consumers shunning Japanese models may turn to market leaders General Motors Co., which this year has sold 1.84 million cars in China under brands including Buick, Chevrolet and Cadillac, and Volkswagen AG, whose two joint ventures have sold a total of 1.49 million vehicles this year. The Japanese leader, Nissan, has sold some 485,000 vehicles in China so far this year. Nissan, whose shares fell yesterday by the most in four months as protests turned violent in some Chinese cities, led a rebound in shares of Japanese automakers in Tokyo trading today. Japan's three biggest carmakers -- Toyota, Nissan and Honda -- have reported attacks on their dealerships in the eastern port city of Qingdao and halted production at Chinese plants. Suzuki Motor Corp. suspended operations at its motorcycle factory. Officials at Nissan, Toyota, Honda, Suzuki, Mitsubishi Motors Corp. and Mazda Motor Corp. said they're assessing the situation in China. While automakers have been among the hardest hit Japanese companies, the diplomatic crisis puts at risk bilateral trade in goods ranging from rice to tractors that has tripled in the past decade to more than $340 billion. The tensions also further complicate policymakers' efforts to fortify growth in Asia's biggest economies as the European debt crisis saps demand for exports. The protests center around a decades-long dispute over a group of islands, known as Diaoyu in China and Senkaku in Japan. Tokyo Governor Shintaro Ishihara reignited the row in April when he said he may use public funds to buy the islands. Protests in China have since escalated, with some demonstrators torching auto showrooms and smashing Japanese-branded vehicles. Thousands of protesters marched in Chinese cities yesterday on the 81st anniversary of the Manchurian Incident, an attack on a Japanese railway that historians say was used as an excuse for Japanese soldiers to invade China. Demonstrators in Shanghai gathered at the Japanese consulate chanting "Down with the Japan devils, give back Diaoyu." Many dealerships in China that sell Japanese cars have closed after some showrooms were attacked and vandalized, according to Luo Lei, deputy secretary general of the state- backed China Automobile Dealers Association. The sales declines will likely hurt the Japanese manufacturers more than last year's earthquake and tsunami, which closed factories across Japan, Luo said. "The impact caused by natural disasters can be fixed quickly, while it takes a longer time and more effort to make hostile sentiment against Japanese cars go away," Luo said in a Sept. 17 interview. Unverified photos posted on online forums this week showed Toyotas with their badges covered by logos of Chinese brands such as BYD Co.
And Japanese car dealerships have hung Chinese flags and banners proclaiming patriotism for China. "Everyone's attitude toward Japan is so hostile now," said Zhang Jian, a salesman in Chengdu at a Mitsubishi dealership that sported a Chinese flag in its windows and signs vowing support for China's claim to the islands. "Although we are selling a product from a Japan-China joint venture brand, it has nothing to do with how we feel about the Diaoyu islands. We are Chinese and support China's claim." Walk-in customers dropped by half over the weekend at the dealership and sales will be hurt should the tensions persist, Zhang said. 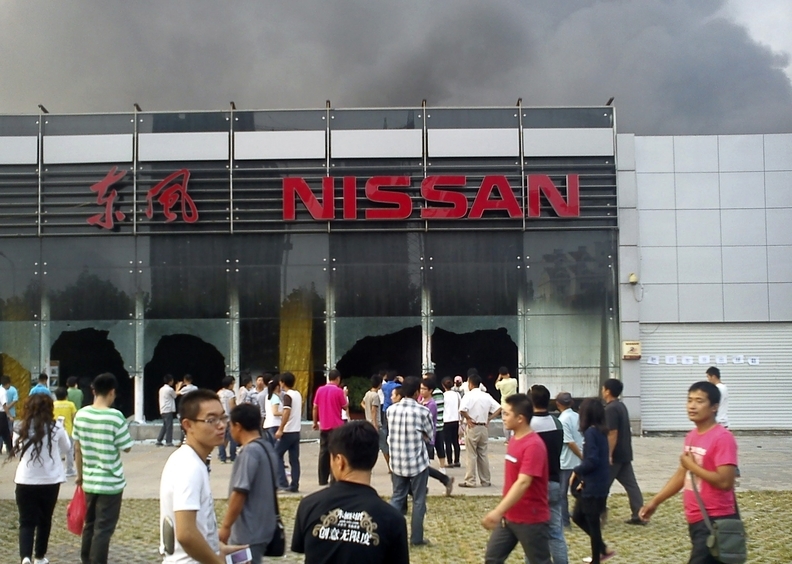 At a nearby Nissan distributor, sales manager Julien Chen said police stepped up patrols after attackers damaged showrooms in Qingdao. The Nissan dealership and a Toyota showroom nearby shut operations Sept. 16 as a precaution, Chen said. The collective market share of Japanese car brands, No. 1 among foreign nameplates in China since 2005, will probably fall to 22 percent this year, while German marques could increase their share to 22.5 percent, according to projections by China's Passenger Car Association. The slide may have already begun as sales of Japanese- branded cars fell last month in China, compared with gains of more than 10 percent for German, American and South Korean vehicles, according to the China Association of Automobile Manufacturers. Shun Maruyama, chief Japan equity strategist at BNP Paribas SA, said transportation is the Japanese industry most reliant on China. Goldman Sachs Group Inc. estimates China accounts for 30 percent of profit at Nissan, 17 percent at Toyota and 15 percent at Honda. Some analysts said concerns may be overblown. "Since neither Japan nor China are really interested in a serious conflict that would harm both economies, I expect a solution to be found soon," said Klaus Paur, Shanghai-based global head of automotive at researcher Ipsos. "With an appropriate marketing and communication offensive, Japanese carmakers may then quickly try to regain some lost ground." In the short term, anti-Japan sentiment will hamper expansion plans by Japanese carmakers, with September sales probably hitting the low point for the year, Paur said. Nissan has the biggest plans in the country, with its China venture budgeting 50 billion yuan ($7.8 billion) in investments to raise sales to more than 2.3 million vehicles in China by 2015 from 1.3 million in 2010. Toyota said this month it aims to increase Chinese deliveries to 1.8 million vehicles by 2015, more than double the tally last year, by adding at least 20 new models. Honda said in April it plans to double deliveries in the country over four years after being "too cautious" in its expansion. While the tensions will almost certainly hurt sales in the short term, over time Japanese cars will likely find buyers, said Zhou Jincheng, an analyst at researcher Fourin Inc.
"Chinese consumers understand that Japanese products are good quality," Zhou said. "So Japanese carmakers shouldn't have to worry about the products themselves, but they may need to review their business plans in the country with regard to the nation's political situation."